Kolob Canyon in Utah is a deep gorge tucked amongst the towering red rock cliffs of Zion National Park. A trip to this area of the country would not be complete without visiting the state’s oldest national park. Explore the many trails through the mountainous terrain and get an unparalleled view of the canyon. For easy access to Zion and other national parks, book one of our Family Time Vacation Rentals, which are all conveniently located near well-recognized sites. 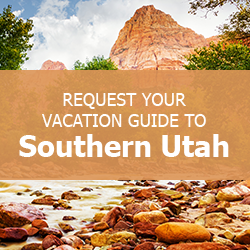 Southern Utah offers endless opportunities to experience the beauty of nature. If you’re an outdoor enthusiast, you will undoubtedly want to visit Kolob Canyon in Utah. Learn about even more places to visit by downloading our complimentary Vacation Guide! It’s packed with local insight on the best places to hike, eat, and so much more. Adventurous travelers seeking a less conventional experience should consider a trip to the Kolob Canyon in Utah. This unique area of Zion National Park is not as well-known, making it much less crowded than other parts. Visitors often experience a more profound connection with the landscape at Kolob Canyon because of the quiet solitude. Breathtaking falls and 2,000-foot red sandstone cliffs greet you in this northwestern corner of the park. The Kolob Canyon Visitor Center hours are 8 a.m. to 4:30 p.m. every day. Stop at the center to pay the entrance fee, browse the Zion National Park Forever Project bookstore, or obtain a wilderness permit needed for canyoneering. Many people choose to follow the Kolob Canyon scenic drive on the way to another stop. If you’re pressed for time and can’t walk around the park, this is a great way to experience the stunning desert scenery. Pick up the 5-mile route at exit 40 off of I-15 and continue through an elevation of more than 1,000 feet. Be sure to drive carefully and slowly as the incredible surrounding landscape can be quite a distraction. Look out for signs announcing designating viewing areas at prime locations. While driving, you’ll pass the 120-mile Hurricane Fault, a major fracture in the ground. You may also spot a variety of wildlife on the cliffside including ravens, eagles, and mule deer. From the scenic byway, you can also access many of the Kolob Canyon trails. The best way to experience Kolob Canyon in Utah is hiking through some of the desert trails. One of the most popular routes is the Taylor Creek Trail, which leads to the famous Kolob Canyon arch. At 287 feet long, the arch is considered the second biggest in the world, falling just three feet short of the largest. Though hikers are not actually permitted to access the arch, two trails lead to a fantastic viewpoint. With more than 20 miles of hiking trails, you could spend several days exploring all the sites in Kolob Canyon. If you’re an experienced outdoor adventurer looking for something different, Kolob Canyon canyoneering is another favorite activity in this area of the park. After a long day of hiking and exploring the Kolob Canyon in Utah, you’ll need a comfortable place to come back and relax. Family Time Vacation Rentals offers properties in four different locations all within an hour’s drive of this site. To stay as close as possible to the canyon, choose one of our Parowan cabins. If you want to stay close to other area attractions like Bryce Canyon National Park, book a stay in one of our Brian Head or Duck Creek Village homes. 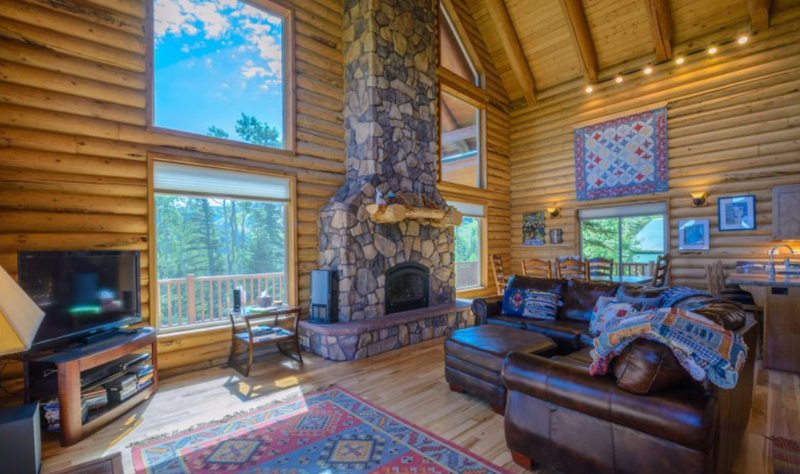 The Navajo Ridge is a charming Brian Head log cabin large enough to accommodate up to 10 guests. From the wraparound porch, you can enjoy 360 views of the surrounding mountain landscape. If you’re visiting in the winter and plan to go skiing, this property is conveniently located right above the Pioneer lift at the Brian Head Ski Resort’s Navajo Mountain.